I read this article. It says that for the 'Mark Done', students must manually mark done before they can progress to the next activity. I tested in my course. I did not mark done but was able to progress. Can anyone verify this please? Does the same rule applies for the rest of the activities (i.e. must satisfy the set requirement before student can progress)? As the teacher, the prerequisites do not apply and you cannot mark something as done. As the test student (click on Student View), the rules do apply. They also apply to regular students. I just now went into my sandbox course and added some module requirements. Then I went into Student View and it didn't not allow me to access anything past the first "Mark Done". That you are having the students complete all of the requirements and that they must be done in sequential order. Here is the relevant section from the documentation you linked to. Sometimes when changing prerequisites, it warns about relocking the module. This is especially true if you add requirements after the module has been in use (for you, but the Student View). You may want to try relocking the module to make sure it re-reads the changes. Thank you. My bad, I did not provide enough information. So my setting is as below. I don't require students to follow linear sequence. I tested via 2 ways. 1 using the student view. The other was using an actual student test account. For both cases, I was able to progress or jump to anywhere in the module. I suspect the reason to this is that my setting does not require a linear navigation. Is this correct? Then it would be logical that the progress did not stop. It is for students to self-check on their progress. Yes, you are correct that because you don't have that box checked the students don't have to complete the items in linear order. If the purpose of this was to have students self-check their progress (similar to this - Help Students Monitor their Course Progress ) then yes, this works just fine. 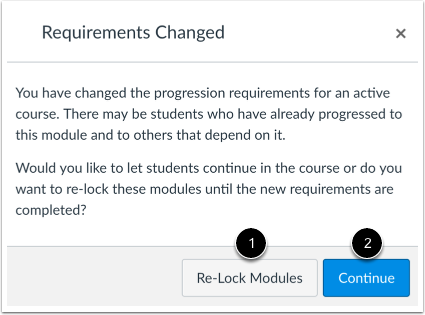 If you want students to have to complete everything in a module (regardless of the order that they complete things) before they can move on to the next module, then you would want to add a prerequisite to the next module - How do I add prerequisites to a module? Thanks Kona Jones. This is really helpful.